Hello! 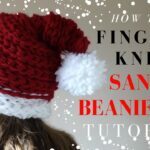 Welcome back to this week’s “How To”… today, I show you an oh so simple “no knit” Knitted Christmas Stocking. This forms part of the “Christmas in July” season. Which is designed to give you plenty of time to hunt around for any materials and get your crafts made! I saw this idea on this & that round about the 23rd Dec 2010…. and made some there and then. Such a fab and simple idea.. In December last year I was still a disliker of sewing machines. 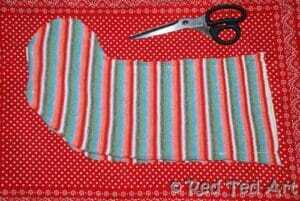 Now I am a sewing convert… so, you can hand stitch this or use a sewing machine! Your choice! 1. I used a much loved moth eaten jumper of mine. And was so pleased to be able to recycle it. I was rather pleased with myself when I also “recycled” the little turquoise buttons it came with! Later I bought an additional jumper in the charity shop and made one of The Englishman. I need to make another for myself this summer… Lay your jumper out neatly and look at where your largest surface area is. 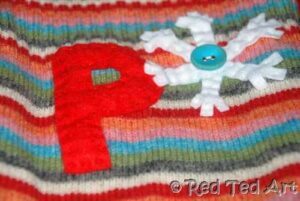 I think it is nice to use the original’s jumper’s ribbing as the top part of your stocking. This gives it a nice neat edge. I was lucky that when I cut off the arms and opened them up, there was enough surface for a 2nd stocking. My charity shop jumper had tighter arms, so wasn’t big enough for two. 2. Make a stocking shape with pins and sew all along them. You can of course cut a stocking shape first – just trace it on newspaper first. I tried to make sure that my stripes aligned! But I am sure no one will mind if yours don’t! 3. 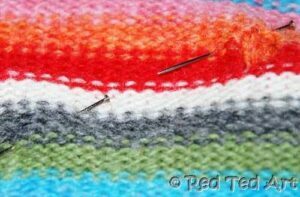 Cut & make a little loop with any remaining ribbing. 4. 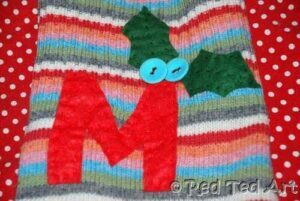 Use some felt scraps to add initials and Christmas details. Done! 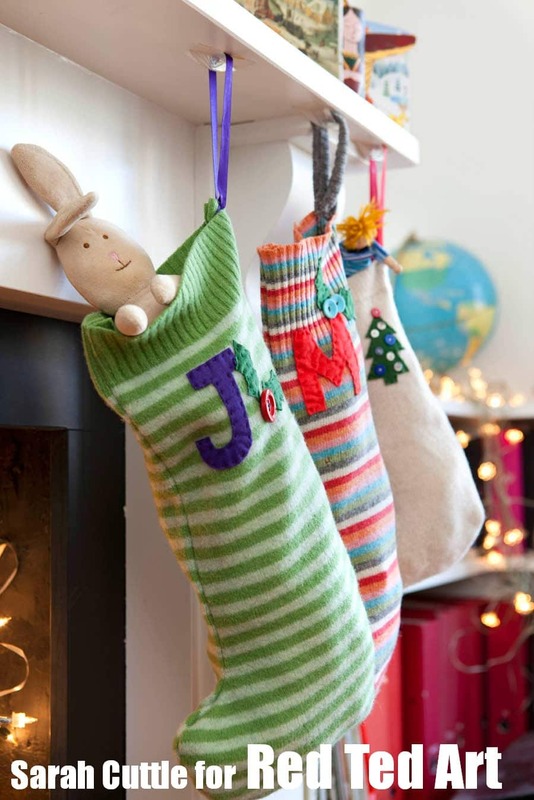 Aren’t these “No Knit Knitted Christmas Stockings” just simply adorable? I did have to darn some moth holes.. but thought that for stockings you can get away with it… opposed to wearing a moth eaten jumper! 🙂 thank you Salma! I am TOTALLY in love with ours…. just need to make one more…. 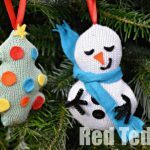 The girls were knitted jumpers at Christmas which were a bit too bright and Caitlins’ was too small.This would be a great way to recycle them. Jingle Bells! I LOVE this. 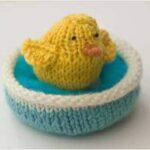 I am thinking I could make a whole string of them with some of the children’s jumpers I can’t bear to part with! That is such a great idea! How exciting to see such wonderful Christmas ideas in July! Love this – so pretty! Why is it whenever I try to do something with an old jumper it just looks like, well, an old jumper?! very clever! If i remember (my memory leave a great deal to be desired these days!) I’ll do these near the end of the Autumn term in my Textiles lessons with my Year 8 boys! The topic? Upcycling! How cute !! I wish more people would start with their Christmas projects so we could get a jump on all of them. I end up seeing something I’d love to make for Christmas but it’s already too close to Christmas. I love it! 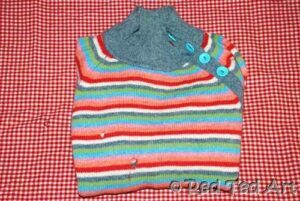 A great idea for my old sweaters. Ah…the endless possibilities. I love this idea! 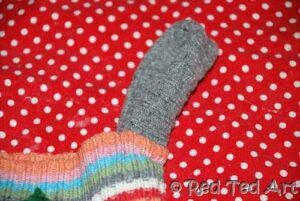 A great way to upcycle, and a “cheat” for those cute hand-knitted stockings you see everywhere! I will be featuring this on my blog tomorrow for Three Things Thursday! Hope you’ll drop by, check it out, and grab a featured button if you like! Guess who will be scouring the charity shops in the coming weeks!? Lovely idea. Squeeee! Loving this idea too… ohh I’ve come over all festive!!! 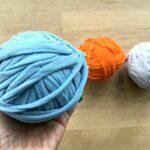 Thanks for linking up to Handmade Thursday! A fantastic idea! Your stockings came out darling. 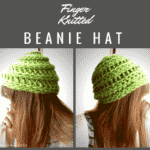 I like the the knitted fabric you used…very Christmas-y I will definitely have to try this. A friend and I were thinking of making Christmas stockings for the children at a local safe house. We crocheted them one year. But I think it might be fun to try this. Thank you for the tutorial. Ooh how lovely! They would be perfect for the safe house – as you can make more of them quickly and they still look lovely! What a lovely idea. 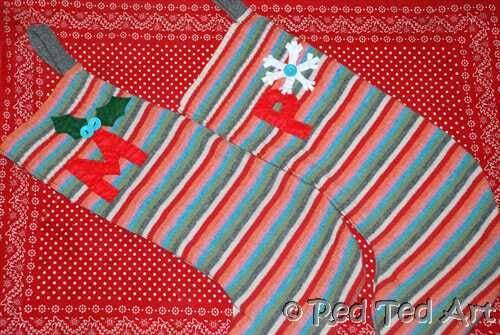 I used to make a lot of Christmas stockings when I had my knitting machine but they were never this easy! Great idea – I am going to get organised and make these ! Yes!! You should, this is perfect “Knitting Stocking” for those amongst us who don’t knit.. actually, I knit and this is still perfect!!! This truly is perfect for those of us who can’t knit. (Me!) The homemade stockings I started 9 years ago are sitting unfinished in a box. My kids would love this. 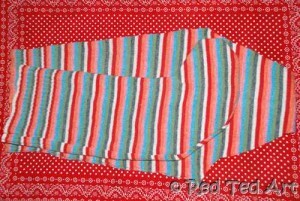 We have some old sweaters with holes that we could easily turn into stockings. 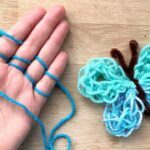 I would love for you to submit this to the Make and Takes spotlight page (http://www.makeandtakes.com/spotlight). I think it would be a perfect fit. Thank you Tracy & Lindsey! Lindsey – have submitted! Great tutorial. They look fab. Hope you’ve made one for you too. I’m sure Santa will bring you some lovely crafty goodies! Oh how lovely lovely lovely! Am so pleased! DO make something and send me a picture? I would LOVE to see it! These are so cute! They turned out very festive for a non-Christmas themed jumper. 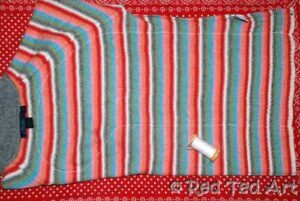 I might have to try this with some old sweaters…..
Oh yes do do! And if you don’t, send me your jumpers! I need one more! Great idea! If you have a chance, I would love to have you link up to my craf & recipe linky at Rhings that make you say mmmmm! Definetly going to make a couple!